Looking to charter a flight to your remote site operation or go on an Alaskan flightseeing tour? Our helicopters serve multiple agencies, businesses and individuals each year. 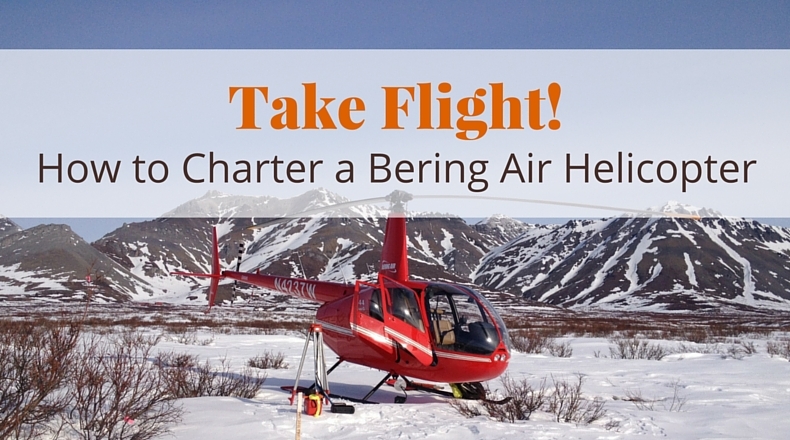 Here’s how you can charter a Bering Air helicopter for your next wilderness expedition. Alaska’s wilderness provides ample opportunities for field surveys and environmental studies. These remote site operations typically take place in areas of Alaska that cannot be accessed by fixed-wing aircraft. If you’re working in the field, our AMD/OAS-qualified pilots and helicopters can safely fly your team to your exploration destination. Plus, Bering Air can transport everything you need to your camp. If it can’t fit inside the helicopter, chances are, we can still move it! Our sling equipment can haul 4-wheelers, snowmobiles, generators, tent frames, bulk fuel – and even your refrigerator! Each helicopter in our fleet is flown by a single pilot and has room for up to 3 passengers. Leather seats and headsets afford a comfortable ride to your destination. Under seat stowage allows room for small backpacks and gear. MD Helicopters MD500E: This light utility helicopter has proven reliability in the field hauling passengers and cargo to remote sites. It’s certified with generous external load lifting capability. We have three aircraft in the fleet, each capable of carrying three passengers or 800 pounds of gear inside. This helicopter has an external sling load lifting capability of 1200 lbs. Robinson R44 Raven II: This economical helicopter has proven reliability in the field hauling passengers and cargo to remote sites. It’s capable of sling, basket and pod external loads. We have three aircraft in the fleet. Each helicopter is capable of carrying three passengers and loads up to 700 pounds using the cabin, slings, baskets and pods. Helicopter requests are highest during the summer months, as there are lots of surveys and studies to be completed once things thaw out. Interested in learning more about chartering us for remote site operations? Check out our Helicopters page for details. Embark on an unforgettable adventure and experience the breathtaking beauty of Alaska by air. Take in panoramic views as you soar above mountains, valleys and waterways. Photo opportunities abound! Nome Flightseeing Tour: Get a bird’s eye view of Nome, Alaska and the awe-inspiring shores of the Bering Sea. Next, head inland and cruise through the Kigluaik Mountains, where you can spot bear, moose, muskoxen and other wildlife. Available year round. Iditarod Flightseeing Tour: See the Last Great Race on Earth® like never before. Fly just 22 miles east of Nome to Safety, the final checkpoint on the Iditarod trail. Take a 30-minute break on the ground to meet checkers, vets, mushers and dogs. Available March 12-20, 2016. Our helicopters are equipped with headsets for in-flight conversation. Tours require a minimum of 2 persons, with a maximum 3 persons per helicopter. Singles may call and sign-up to go when space is available. Ready to get started? Request a quote for your remote site operation, or call our Nome office at 907-443-5464 or 800-478-5422 to schedule a flightseeing tour.